Want a Halo 3 Beta Invite? 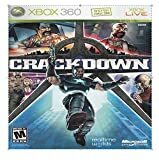 Buy Crackdown. If you’ve checked out the latest issue of Gamepro, as CheapAssGamer member Trakan has, you’ll notice that the Crackdown ad has a nice little notice in the bottom-right of the ad. What does it say? Need proof? Check out the image yourself: Crackdown Ad from GamePro. I get the feeling that we’ll be welcoming Crackdown to the “Platinum Hits” program sooner, rather than later.